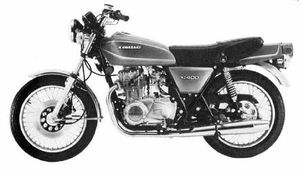 Remarks: Improved KZ400D. Mas six gears, diaphragm fuel tap, and automatic side stand return mechanism. Steering lock is combined with ignition switch. Needle bearings are used in swing arm.